But please, do a better job of resisting than … well, than I just did. Sure, there was a familiar ending to the Red Sox’ 3-2 loss to the Detroit Tigers this afternoon. The Tigers walked off victorious in their final at-bat just as the Orioles did in the final, collapse-confirming loss a season ago. Alfredo Aceves as Jonathan Papelbon, Austin Jackson as Robert Andino … yup, it all lines up. And with anointed-by-attrition closer Aceves giving up the winning hit, and Mark Melancon setting the stage for defeat with an ineffective Red Sox debut, little was done to ease the concerns about the back of the bullpen with closer Andrew Bailey sidelined for 3-4 months. With an off day tomorrow, the pot will be really get boiling. It’ll be a good day to be a cantankerous sports talk show host. But please, resist any temptation to blow it out of proportion. It’s one game, a taut if occasionally plodding one-run loss to a damn good team with the best pitcher in baseball on the mound for eight innings. There’s no shame in that. I know, the surface familiarity of the loss — the slow walk off the field as the home team celebrates — is a lousy way to begin a season for a team that is in dire need of a clean slate. And moral victories are no fun on Opening Day. But the frustrating plot shouldn’t obscure at least one very good thing to come from this game. Jon Lester looked like an ace. He was excellent, allowing six hits and one earned run in seven innings. No, he didn’t get the win, but neither did the other guy, and when you match up your best pitcher and he goes strike-for-strike with Justin Verlander, the best pitcher in baseball and reigning Most Valuable Player who is coming off a season that mirrors Roger Clemens‘s transcendent ’86, it’s an encouraging sign. Lester traditionally starts slowly in April. If he can avoid doing so this year, perhaps he’ll give Verlander, who was armed with his most electric repertoire today, as much competition for some major awards as he gave him on the mound today. To put it another way: Had the version of Lester we saw last September pitched like the one we saw today, there would have been postseason baseball at Fenway. Despite their 0-for-1 start — “Hey Michael Kay! Ask ya buddy Valentine if he’s evah gonna win a game!” — I think they do find their way to the postseason this year. I’m calling them the best winless team in baseball right now. How’s that for a small consolation? * I understand why Bobby Valentine removed Adrian Gonzalez for a pinch-runner down two runs with two on and no one out in the ninth. But I hope it doesn’t become a Jimy Williams-like habit. You do what you have to to extend the game, but I hope he’s selective about it. The Gonzo-out, Nick Punto-in shuffle will get old in a hurry. I swear Jimy pinch-ran Mike Benjamin for Mo Vaughn 150 times in 1998, give or take a few. * The scouting report on Ryan Sweeney is that he’s a fine defensive outfielder with little extra-base pop in his bat. So what does he do? Misread a fly ball that ended up as an Austin Jackson triple (and the Tigers’ second run), then rip a triple of his own in the ninth to drive in the tying run. And he does it off Jose Valverde, who was 49 for 49 in save chances last season but is 0 for 1 this year. Reminds me of former Cardinals pitcher Joaquin Andujar‘s favorite word when talking about the quirks of baseball: youneverknow. * Whaddaya say? Does Carl Crawford catch that shot to the corner by Alex Avila in the seventh that fell just out of Cody Ross‘s reach, plating the Tigers’ first run? I say yes. Despite Crawford’s strangely faulty GPS last September. * I’m not saying Verlander’s curveball should be illegal, but it’s definitely unfair. He should at least be required to tell hitters with, say, a career average below .260 that it’s coming. And maybe tip off the location too. * Mike Aviles looked fine at shortstop, helping to turn three double plays behind Lester. The way some charter members of Iglesias Nation described him this spring, I half-expected him to heave one Hobson-style into the stands and trip over the second base bag at least a couple of times each. * The little rally in the ninth to tie it was encouraging, right? Ah, well, Sox fans. 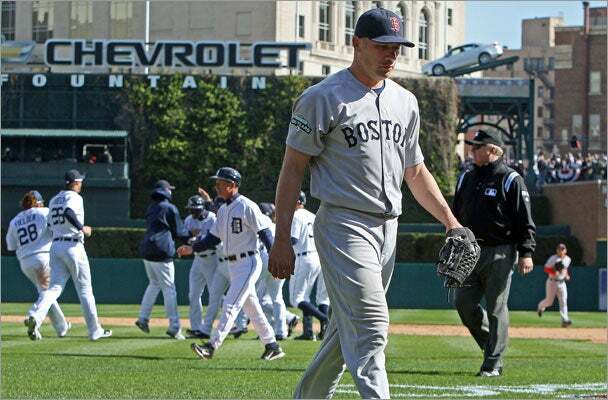 Gripe about it tomorrow, then, with Josh Beckett squaring off against Doug Fister, hope they’ll get ’em Saturday. Oh, and that there are no more thumb injuries in the interim.